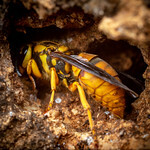 The cumulative points winner across all mysteries for the month of June will win their choice of 1) any 8×10-sized print from my insect photography galleries, or 2) a guest post here on Myrmecos. Oh elytra, duh, I gotta learn to read more carefully. Nice 🙂 I was going to do the same, but was shocked to realize I have yet to photograph any. That’s pretty good, nice detail. I hope your readers aren’t among the illiterati that call a single maggot a ‘larvae’ (or a single exuviae an ‘exuvium’ or ‘exuvia’). I’ve seen these all over. Striking looking insect. 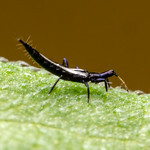 But I too would see these all over, sitting out on top of leaves along forest margins. Given that behavior and their color patterns, I suppose they are advertising that they taste bad.